John Taverner worked for Cardinal Wolsey at Cardinal College, Oxford where Wolsey created one of the finest choirs in England. Peter Phillips speculates that Taverner may have been commissioned to write the mass to show off the choir's trebles, and it is tempting to link it to a possible visit to the college by Henry VIII and Catherine of Aragon in 1527. The work suits very much the style of The Tallis Scholars with the trebles, Janet Coxwell and Amy Haworth, presenting a fabulously even, fluid and unforced high treble line; a remarkable feat of virtuosity. You cannot imagine it being sung better than this. I have had discussions with other ensemble directors about the issue of what pitch music of this period should be performed at, whether we should perform it lower. But there is no doubt that this pitch suits The Tallis Scholars brilliantly. Below the treble, the five other parts sing with their familiar sense of style and fluid line. The whole piece flows evenly and there are some remarkable passages, including ones where Taverner plays on the sheer distance between the top and bottom parts, but it is the trebles who catch our attention. The companion works are Taverner's two version of Dum transisset Sabbatum the Respond to the third lesson at Matins on Easter Sunday. Both use the same chant in the tenor, but around this Taverner creates different harmonies and textures, each achieving the same sense of otherworldliness. If you go to the Gimell website, then you can download the score to both the mass and to the motets, and the Cd booklet comes with an excellent essay as well as full texts. 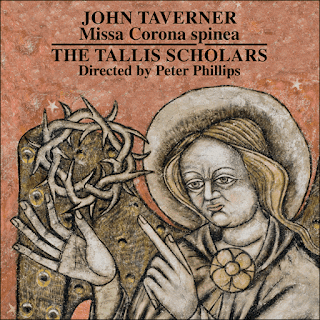 John Taverner's virtuosic, festal masses are inevitably not to everyone's taste but here, with The Tallis Scholars on stunning form it is difficult to imagine an account more poised and more polished.